Blonde to platinum blonde to white, bleached hair color strikes a dramatic look for anyone. Dark hair transforms to beautiful white hair through the process of bleaching and toning. Salons offer this service at a higher cost than what you can do in your home with store-bought products. With a friend, you can share your transformation and enjoy a little help, or you can do it yourself for quick touch ups. Just remember to use gloves. Decide if you can bleach your hair. If you have used a perm or relaxer, do not bleach your hair, because hair is stressed from the first process. Processing your hair again causes your hair to break or melt, leaving you with a bald or patchy head. If you have never bleached your hair, try bleaching one discreet part of your hair to test the outcome. Choose a bleach that is specifically for hair and is safe for your scalp. There are beauty supply stores in most cities, one such retailer is Sally Beauty Supply. You may want to consult a hair stylist at a local salon as well on these products. "Beyond the Zone On/Off Scalp Radical Bleach Kit" is available on Sally Beauty Supply's online site as well as Amazon.com. Another kit that might work well for you is "N Rage Bleach and Toner Kit." "White Out" is sold at Hot Topic and comes with a toner. Wear gloves while handling bleach and wear an old t-shirt. Bleach removes color from whatever it touches. Bleach also burns skin so prepare for some itching and burning. 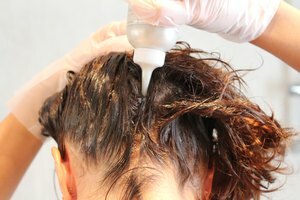 There are products like BioCur, which lessen scalp itching for the bleaching process. However, your scalp may still itch after using it. Start applying bleach one half inch from your scalp. Part hair carefully and saturate each section until all of your hair receives bleach treatment. Do a second run through and go back and apply bleach to missed areas. Watch your hair for the color to change. If you are dying from dark brown, wait for your hair to turn a red-orange color, then begin applying bleach to your scalp. If your hair is lighter brown to red, wait for it to turn orange or yellow, then begin applying bleach to your scalp. Continue letting your hair lighten. Once you receive the right color of lightness, you rinse the hair in cool water and wash the bleach out. You may need to bleach your hair again to receive a lighter color of blonde. Do not leave bleach in your hair longer than 45 minutes. Shampoo gently and rinse well, then wrap in a towel to dry. Choose a purple toner. Purple toners change the yellow/brassiness of blonde, turning it lighter and whiter after a few developments. Some brands of purple toners are "La Riche," "L'Oreal," and "Manic Panic Virgin Snow." There are other toners that will also tint your hair. Use your own judgment on what color toner to buy for your desired bleached color. Test a strand of your hair with the toner to see the time it will take to deliver the toned shade. Begin applying the toner in the same way as the bleach by sectioning parts of your hair and saturating the strands with the toner. Good toners only require 10 minutes to work, but yours may require up to two hours. Rinse your hair in cold water and distilled white vinegar. This process locks in the toner longer for your hair. Condition your hair many times. You may want to buy a salon brand restoration mask. You can buy these in department stores but they may not work as well as salon brands. You need to repair the damage to your hair and replenish the natural oils by conditioning and moisturizing. Purple toners work the best for the lightest blonde colors. However, there are many choices of toners. Familiarize yourself with brands while at the beauty supply store and choose the color best for your desired blonde color. Do not leave bleach in longer than 45 minutes. Hair toner takes up to a few hours to work depending on the type of toner used. How Often Can Hair Be Bleached?